Is it really possible that part of a Western European country could break away, without a legally recognised referendum or the consent of that country's government? Regarding Catalonia, most commentators and politicians in Madrid never thought the answer to that question could be yes. And by refusing to even entertain the idea of a referendum, the Spanish government believed the pro-independence camp in Catalonia would have nowhere to turn. However, Catalan nationalists have forced the issue. A year ago they held their own unofficial (in the eyes of Madrid) referendum. They scored 80% in favour of independence, but turnout was low as many boycotted the vote. Then in September they held a regional election and painted it as a Yes/No vote on independence. The nationalists failed to get 50% of the vote. And only with the support of a far-left pro-independence party did the main coalition, Together for Yes, get past the 50% threshold of seats in the Catalan parliament. But that didn't stop them. A majority of seats for pro-independence parties was enough for them to claim a "mandate" and push on with their project to create a new state. For years Catalan nationalists have been warning me that without a referendum they would still proceed. In September 2012 I was on the streets of Barcelona amid a sea of red- and yellow-striped Catalan flags (many with the blue triangle and silver secessionist star), chants of "independence" and more than a million people. I was struck by their impassioned rejection of the Spanish state. In their eyes, the failings of Spanish politics were catastrophic. For them, the economic crisis enveloping their beloved Catalonia was proof enough. Surely that demonstration was a wake-up call for the Spanish government? However, it was another three years until I and other foreign Madrid-based journalists were invited to La Moncloa - Spain's version of Number 10 Downing Street or the White House - to be briefed on Catalonia by Prime Minister Mariano Rajoy's Chief of Staff, Jorge Moraga. In at times strong language, he wanted to put across how Madrid saw latest events. Catalonia did not get a raw economic deal, he argued. Via Catalan public media the nationalists had manipulated public opinion, creating a false sense of grievance amongst Catalans and the impression that the Spanish state was "anti-Catalan". Mr Moraga, a Catalan himself, said the opposite was true and argued that the voice of those Catalans (like him) whose DNA was both Spanish and Catalan was being drowned out. Around the same time, the Spanish foreign minister went head-to-head on Catalan TV in a debate against a leading pro-independence politician. For many, the Spanish government woke up late from what appeared, at worst, to be a sense of denial over the Catalan question, and at best a policy of non-engagement. Now Madrid is warning that senior Catalan politicians could have their powers taken away if they continue to "disobey" the will of the Spanish state. In one Spanish newspaper this week there was talk of Madrid taking control of Catalonia's autonomous police force, or cutting funding to the Catalan government. After years of inaction, when the arguments and desires of the Catalan independence movement appeared for many in Madrid to be theoretical hyperbole, things now feel real. The threat of Catalan politicians creating their own state, regardless of what Madrid says, is real. The idea of Madrid using the force of law to physically stop this happening could soon become real. Everything could change if there is a change of government in Madrid in a Spanish general election on 20 December. Of course the pro-independence camp have problems of their own. They are an unlikely political amalgamation of right- and left-wing parties. 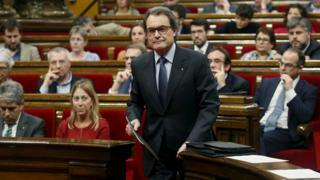 The centre-right President Artur Mas is desperately trying to hang on to power. But those on the far left are unlikely to accept him as their independence king. The impasse between Madrid and the nationalists in Barcelona has produced a sense of political crisis. And no one knows where this will end.